The Holland Landing Animal Hospital in Holland Landing, ON, has been providing our neighbors in town and the surrounding areas with compassionate, skillful veterinary care. 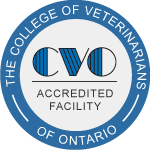 Our veterinarians have many years of technical experience, and we’re able to provide a wide number of services ranging from dentistry to surgery to radiography. We strive not only to help you take care of your animals and pets but also to educate you on ways to continue improving the care they receive at home, such as nutritional guidance and tips on administering medication. We always welcome feedback from our clients, and continually expand our therapies to incorporate new technologies that can benefit your pets and animals, such as our therapeutic laser treatment, which is quickly becoming a valuable tool in treating arthritis, acute injuries and inflammations. At Holland Landing Animal Hospital, your pets and animals benefit from a combination of these new technologies and the kind of tender, gentle care you’d want for a love one. ​Contact us to schedule an appointment today.